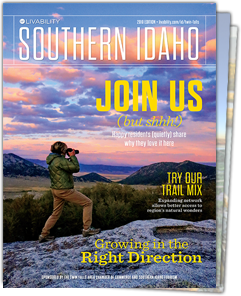 The Thousand Springs Scenic Byway winds through 67 miles of the most remarkable geology and natural beauty in Idaho. Here, you’ll find thousands (really!) of incredible waterfalls, soothing hot springs, charming small towns, and Idaho’s famous trout. Trail Begins: US-30, just after exiting I-84 at Bliss. The Canyon: The byway drops almost immediately into the massive Snake River Canyon. Check out the “melon” boulders and other incredible geology formed millions of years ago. Water, Water Everywhere: You’ll quickly see where Thousand Springs gets its name: There are waterfalls and hot springs everywhere. The vast Snake River Plain Aquifer flows 2,308 miles beneath volcanic rock from the St. Anthony to the Snake River, where it flows over the cliffs at Thousand Springs. Take a boat tour or dinner cruise to get close to these natural wonders. Have a Soak: Southern Idahoans have been enjoying the soothing waters of hot springs for generations. Have a soak yourself at Miracle Hot Springs, Banbury Hot Springs, or 1,000 Springs Resort. Both have public and private pools, as well as camping and RV facilities. Famous Fish: Did you know that 70 percent the trout sold in the United States comes from Hagerman? The pure, cool, oxygen-rich water that flows from the Snake River Aquifer is perfect for raising these tasty fish. Visit a trout hatchery and check out Southern Idaho’s sustainable aquaculture. Quaint Towns and Parks: Grab a cone at Cloverleaf Creamery, one of Southern Idaho’s most beloved ice cream and dairy shops, and explore historic Buhl, home of the annual Trout Festival. Travel further down the road and wander the tree-lined streets of Filer, where Idaho’s largest county fair is held every September. Visit one of the 24 great parks in Twin Falls, including City Park — ringed by historic architecture — and listen to one of the country’s oldest city bands at the historic bandshell. Stop by Hansen and Kimberly on your way to your camping spot in the South Hills. Higher Than Niagara: Towering Shoshone Falls is worth a side trip; this spectacular waterfall is 212 feet — higher than Niagara! See it at its peak in early spring before it is put to work irrigating the area’s fertile farmland. While you’re at Shoshone Falls Park, get on the Centennial Trail. You’ll see unbelievable panoramic views and the launch site of Evel Knievel’s ill-fated 1974 jump.